In late May the UFC and EA Sports launched the first ever #BeTheBoss contest with EA SPORTS™ UFC® 3. 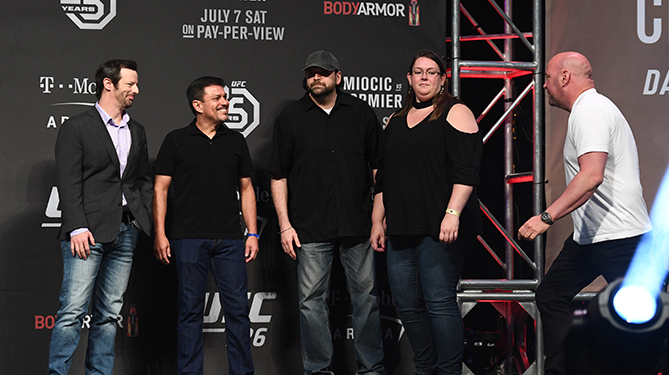 The contest awarded six gamers with an ultimate UFC prize pack that included an all-expenses paid trip to UFC 226: Miocic vs. Cormier. One of the six winners, John Farmer, was selected to receive a private tour of the UFC headquarters, The UFC Performance Institute, train with Forrest Griffin, play EA SPORTS UFC 3 with Dana White, stand on-stage during the UFC 226 weigh-ins and sit in Dana White’s personal Octagon side section during UFC 226. That sounds like one heck of a prize. And for Farmer, a native of Cleveland, Ohio it was the weekend of a lifetime. Farmer has been a diehard MMA fan since UFC 1 but until this contest, he had never been to a live event before. Let’s just say it’s something he’ll never forget. 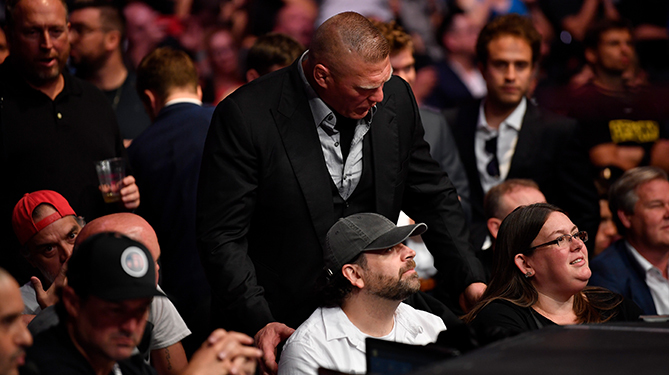 Moments before Daniel Cormier became the baddest man on the planet Farmer, who was sitting adjacent to Dana White, felt someone tap on his shoulder. To his surprise it was none other than former UFC heavyweight king Brock Lesnar. And all of that was just what happened to Farmer and his guest Kari Durnell at UFC 226. On Friday Farmer took a tour of the UFC headquarters and UFC Performance Institute, which culminated in a training session with UFC legend Forrest Griffin. And after getting what Farmer described as “a years’ worth of boxing lessons in an hour”, he went to T-Mobile Arena for the UFC 226 ceremonial weigh-ins. Farmer and Durnell were backstage when the production crew asked Farmer if he wouldn’t mind helping them with walk-out rehearsals. 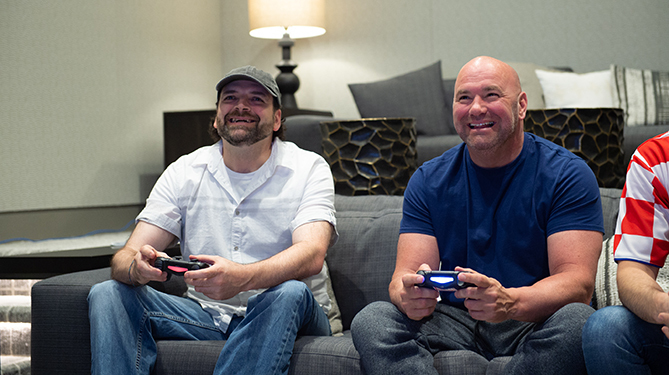 After weigh-ins it was time to hit the sticks and show Dana how he won the #BeTheBoss contest. While he was playing Farmer explained that they missed out on meeting one of his favorite fighters, Miesha Tate, during the fan experience events earlier in the day. Dana proceeded to reach out to Tate and set-up a personal meet and greet for the contest winner. The effort that Dana put into that exchange ended up being the highlight of Farmer’s experience. Now that he’s had a taste of attending a live UFC event there’s no way the self-proclaimed ‘heavyweight champion of the #BeTheBoss contest’ will ever view a fight card the same. The contest may be over but that doesn’t mean you can’t train for the next #BeTheBoss contest. For a limited time only, EA SPORTS UFC 3 Icon Edition is available now through July 17 for Xbox One and PlayStation4 for $39.99. To learn more about EA SPORTS UFC 3 visit https://www.ea.com/games/ufc/ufc-3. EA Access members receive a 10 percent discount when they purchase a digital version of EA SPORTS UFC 3 on Xbox Live.